6896 - ARMY NATIONAL GUARD souvenir embroidered patch. 3". Patches sew or iron-on & are carded for a display rack for stores. 6881 - UNITED STATES ARMY RETIRED embroidered patch. 3" Patches sew or iron-on & are carded for a display rack for stores. 1241 - CALIFORNIA US 101 highway sign, 2.375" tall x 2.875" wide. Patches sew or iron-on & are carded for a display rack for a store. 6868 - UNITED STATES COAST GUARD, 3" - Patches sew or iron-on & are carded for a display rack for stores. 6884 - DON'T TREAD ON ME Gadsden flag souvenir embroidered patch. The Gadsden flag is a historical American flag with a yellow field depicting a rattlesnake coiled and .... Hence the warning, "Don't tread on me (or I will strike)". 3.25" wide x 2" tall. Patches sew or iron-on & are carded for retail rack display for stores. First Navy Jack flag souvenir or uniform embroidered patch. DONT TREAD ON ME. 6843 - DONT TREAD ON ME. First Navy Jack flag. One of the first (1775) Colonial Flags with 13 stripes. 2" tall x 3.125" wide. Iron-on backing. Patches are carded for a display rack. 6891 - LAND OF THE FREE - BECAUSE OF THE BRAVE patriotic embroidered patch. 2.75" tall x 3.75" wide. Sew or iron-on. Patches are carded to hang on a display rack for retailer stores. 6873 - U.S. MARINES, MESS WITH THE BEST, DIE LIKE THE REST embroidered patch. 3". Patches sew or iron-on & are carded for a display rack for stores. 6863-01 - UNITED STATES MARINES CORPS embroidered patch on black twill - 3". Patches sew or iron-on & are carded for a display rack. 6863-36 - UNITED STATES MARINE CORPS on red twill embroidered patch. 3". Patches sew or iron-on & are carded for a display rack for stores. 6883 - U.S. MARINE CORPS - RETIRED embroidered patch. - 3" - Patches sew or iron-on & are carded for retail display. 6863/V - U.S. MARINE CORP VETERAN embroidered patch. 3". Patches sew or iron-on and are carded for a retail store display rack. 6882 - U.S. NAVY RETIRED embroidered patch. - 3" - Patches sew or iron-on & are carded to hang on a display rack. 7432 - OFFICIAL U.S. TAX DEDUCTION embroidered patch. 3" round. Made in USA. Patches sew or iron-on & are carded for a display rack for stores. 6847 - peace fingers embroidered patch. 3 5/16" tall x 1 .875" wide. Patches sew or iron-on & are carded for a display rack for stores. 7476 - POW-MIA, YOU ARE NOT FORGOTTEN embroidered patch. 2 7/16" wide x 3" tall. Patches sew or iron-on & are carded for a display rack for stores. 7476-36 - POW-MIA, YOU ARE NOT FORGOTTEN - 2 7/16" wide x 3" tall - Red on Black - Patches sew or iron-on & are carded for a retail display rack for stores. 6863/P - PROUD PARENT OF U.S. MARINE embroidered patch. PROUD PARENT OF U.S. MARINE. 3". Patches sew or iron-on & are carded for a display rack for stores. 6854 - rebel confederate flag historical, uniform, or souvenir embroidered patch. 2.125" tall x 3.5" wide rectangle. Patches sew or iron-on & are carded for a display rack for stores. 6866 - SEABEES, 3" - Patches sew on & are carded for a display rack. Made in USA. 6834-11 - Thin Blue Line US flag embroidered patch for souvenir or uniform - 2" tall x 3.375" wide - Iron-on backing. Patches are carded for retail rack display. Supports all in Law Enforcement. 6834-36 - Thin Red Line US flag embroidered patch for souvenir or uniform - 2" tall x 3.375" wide - Iron-on backing. Patches are carded for retail rack display. Supports all Fire Fighters. 6885 - U. S. AIR FORCE RETIRED souvenir embroidered patch , 3" - Patches sew or iron-on & are carded to hang on a display rack for stores. 6872 - U.S. ARMY - ONE SHOT ONE KILL souvenir embroidered patch. 3". Patches sew or iron-on & are carded for a display rack for stores. 7477 - U.S. BORDER PATROL novelty or souvenir embroidered patch. 3". Patches sew or iron-on & are carded for a display rack for stores. 7431 - U.S. IMMIGRATION novelty or souvenir embroidered patch. 3". Patches sew or iron-on & are carded for a display rack for stores. 6862/V - U.S. NAVY VETERAN souvenir embroidered patch. 3". Patches sew or iron-on & are carded for a display rack for stores. 6865 - 3" UNITED STATES AIR FORCE embroidered patch. Patches have an iron-on backing & are carded for a display rack for stores. 6861 - UNITED STATES ARMY embroidered patch.,3". Patches sew or iron-on & are carded for a display rack for stores. 6861/V - UNITED STATES ARMY VETERAN souvenir embroidered patch. 3" patch. Patches sew or iron-on & are carded for a display rack for stores. 6862-08 - UNITED STATES NAVY on navy blue twill souvenir embroidered patch. 3". Patches sew or iron-on & are carded for a display rack for stores. 6862-39 - UNITED STATES NAVY on white twill souvenir embroidered patch. 3". Patches sew or iron-on & are carded for a display rack for stores. Made in USA. 6867 - UNITED STATES NAVY embroidered patch. 3" - Patches sew or iron-on & are carded for a display rack for stores. 8101/2 - 2" tall x 2.375" wide - Patches sew or iron-on & are carded for a display rack for retail stores. This smaller patch (8101 is full size) is best for low profile caps & knit beanies. 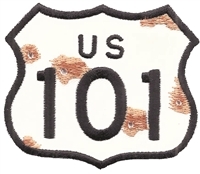 8103 - US 101 bullet holes & rust sign souvenir patch. 2.375" tall x 2.75" wide. Patches sew or iron-on backing & are carded for a display rack for retailers.